Curious minds find hundreds of fascinating facts in Smithsonian Everything You Need to Know: Grades K-1. 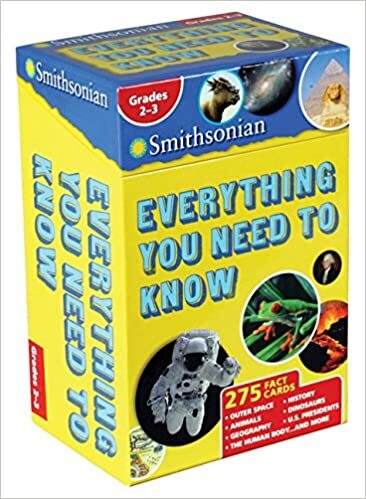 The flip-top box is packed with 275 fact cards covering categories such as Earth and space, plants and animals, geography, history, and health. Whether it’s the number of teeth in a great white shark’s mouth or how a rainbow forms, kids ages 5–7 will learn a variety of information in a tactile and engaging manner. Each flip of a card not only showcases beautiful color photographs and illustrations paired with a fact, but also presents a new learning moment. 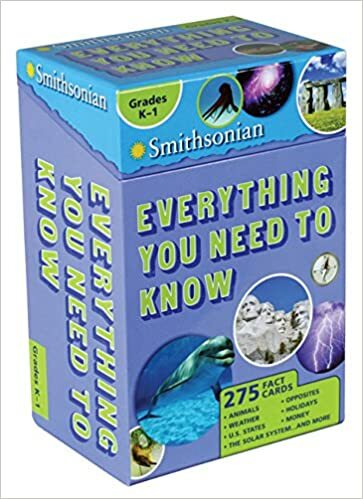 With this packed-full box of facts, kids are given an extra opportunity to learn all they need to know for early science, social studies, and history exploration in a fun format that’s sure to engage eager young minds. How many rings are there around Saturn? What causes an earthquake? How many bones are in a giraffe’s neck? With Smithsonian Everything You Need to Know: Grades 2-3, kids ages 7-9 will learn exciting and interesting facts about Earth and space, plants and animals, geography, history, and health. Each of the 275 fact cards includes colorful photos and illustrations coupled with a fascinating fact. From the solar system to George Washington to volcanoes, each fact card presents educational material in an innovative and engaging format. Inquisitive kids will have hours of fun discovering everything their young minds need to know in this interest-packed fact card set. Don't let the pictures fool you. These decks are huge and hefty. One side of the cards have gorgeous full color images and the other useful trivia. This is less a game and more a series of flash cards. There's a lot of a neat trivia in these, but they are very much for their age groups. In many ways, I think the K-1st Grade one might be a little young for first graders, but such is life, but Grades 2-3 definitely seems appropriate. The only issue I can see with these is that sometimes it's a little difficult to get the cards back in the box. They're a pretty cool investment and I think would be good quiz aids if you happen to be working on those sorts of things. Do it up, folks. Just be careful putting cards back.